ESSENTIAL OILS ARE EVERYWHERE TODAY. SO, WHAT EXACTLY ARE THEY? WHY IS EVERYONE TALKING ABOUT THEM? wHY DO i NEED THEM? hOW DO i GET ESSENTIAL OILS IN MY HOME? We hear you. We get these questions daily. So, we decided to put all of that information in one place, just for you. We know it may be a lot, but we are going to break it down for you. And if you do better with hearing and seeing the information, we've got you covered too. We have free on-line essential oil classes scheduled regularly. We are here to help you learn and guide you along your essential oil journey, so please let us know how we can help! So we've all heard someone mention an essential oil before...but what the heck IS it?! Chances are you have come into contact with essential oils throughout your life, you just didn't know it. When you rub the needles of a pine tree together and bring your fingers to your nose, or when you peel an orange and notice that the smell lingers on your skin, you are experiencing the power of essential oils. An essential oil is simply a liquid that is generally distilled (most frequently by steam or water) from the leaves, stems, flowers, bark, roots, or other elements of a plant. They give plants their distinctive smells, protect plants from environmental threats, and play an important role in plant pollination. Contrary to the use of the word "oil," pure essential oils are not oily-feeling at all. Most essential oils are clear, but some oils can be amber, yellow, or even blue in color. Essential oils have been used by humans for centuries for food preparation, beauty treatments and products, spiritual practices, and health care. Essential oils can be used for a wide variety of benefits including health and physical wellness, emotional aromatherapy, and natural cleaning and beauty products. They can be used individually, or in special blends formulated for specific needs. The power of essential oils is founded in research and is an increasingly popular topic in many scientific arenas today. It is important, however, to know that not all oils are created equally. There are many grades of essential oils, ranging from perfume grade found in most cleaning and body products, to Certified Pure Therapeutic grade found in those produced by doTERRA, the world's leading essential oil company. Some people are hesitant to start sing essential oils in their daily routine, because they are just not sure what to do with them. We get it....we hear it quite often, and frankly, that is why we are so passionate about essential oil education! 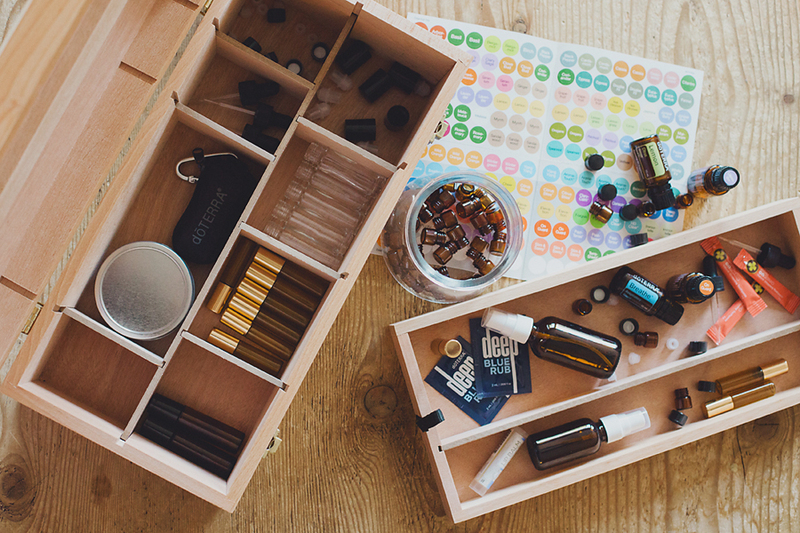 Today we are going to share a few ways for you to get started using your essential oils. DIFFUSING: A diffuser is used to disperse essential oils in a fine vapor, allowing the aroma and benefits of the oils to hang in the air. Unlike a humidifier, diffusers do not add moisture to the air. Instead, they produce a cool mist, and are specifically designed to be used with essential oils. In addition, using a diffuser is a much safer, less expensive, and non-toxic alternative to candles and incense. Diffusing is a great way to purify the air, elevate mood, improve mental clarity, ward off germs, repel insects, provide relaxation, and so much more! Simply add a few drops of an essential oil(s) of your choice to a diffuser in your home, office, car, etc. to instantly receive aromatic benefits. INHALING: Don't have a diffuser near by or need a something a little more intense? Place 1-2 drops of oil in the palm of your hands and rub together, creating friction. Cup your hands over your nose and mouth, avoiding the area around your eyes, and breathe deeply. You can also simply inhale straight out of the bottle! We like to inhale any left over oils from our hands after applying them topically for added benefits. Check out this article on the "Power of Aroma" for more information on how our sense of smell affects our bodies and why simply smelling essential oils can be so helpful. To use essential oils topically, simply place 1-2 drops into your hands and apply to the targeted area. When beginning topical use, dilute every oil with fractionated coconut oil (FCO) and start by applying to the bottom of your feet. This will help to reduce the small risk of experiencing any skin sensitivities, especially in young children. As you use your oils over time, you may begin to apply the essential oil neat if no sensitives are evident, although applying with FCO is always recommended and can even boost absorption. Some of our favorite places to apply oils topically are the bottoms of the feet, the inside of the wrists, and along the base of the neck and spine. Taking essential oils internally can have amazing health benefits. Be sure to look at the label before taking anything internally and do your own research. it's important that you feel comfortable using essential oils in whichever ways work for you to help you reach your health goals. doTERRA's Certified Pure Therapeutic Grade contain 100% essential oils, making them safe for ingestion. The easiest way to begin taking oils internally is by putting a drop or two in your water, tea, or smoothies. Make sure you are using a glass, stainless steel, or ceramic container as some essential oils will disintegrate plastics. You can also begin adding essential oils to your favorite recipes in place of spices and herbs. Remember, our essential oils are incredibly potent so start with 1 drop or insert a toothpick into the bottle and add to your recipe to avoid an overpowering taste. You can also ingest essential oils by filling an empty veggie capsule with whichever oils support your needs. Just be sure to take the capsule shortly after creating it as the oils will disintegrate over time. In addition, doTERRA has created some amazing supplement products that conveniently come with encapsulated essential oils to take the guess work and energy out of making your own. The best way to get your hands on these amazing essential oils is through your very own wholesale membership account. Much like a Costco card, this membership gives you access to a 25% discount off of ALL dōTERRA products. No hidden fees, no obligations. This membership is $35 initially for the first year, and $25 to renew each year after. Your membership renewal also comes with a free 15mL bottle of Peppermint ($27.33 retail) as a gift. In addition to saving money, your membership account also allows you to earn free product, get your shipping dollars back as rewards points, and gets you access to all kinds of education and mentoring. There are two types of members. Take a look at the description of each and see which one speaks to you. Wholesale Customer: Wants to use quality essential oils and products. Wellness Advocate: Wants to use quality essential oils and products and is looking to supplement or replace their current income by sharing with others. Whether you are the person who needs to have it all or are ready to jump into building up a doTERRA business, the Diamond Kit is pefect because it comes with a savings of over $200.00. Just about every essential oil and product come in this powerhouse bundle.